Here’s a special blog from designer Alan Copeland introducing the Chun Co. Teppanyaki Grill, a part of the Itadakimasu! Japanese-Inspired Dining Set available Thursday, November 1st exclusively on the Sims 3 Store! 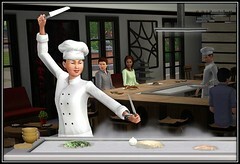 Are you excited about the recently announced Wood Fire Oven that’s part of The Sims 3 Monte Vista? Yeah, me too! The Wood Fire Oven is just one of the Premium Content items that are coming your way over the next several months. Today I want to introduce you to another exciting object that will be out very soon. It not only introduces a bunch of exclusive new recipes, but also gives your Sims the ability to entertain people by performing exciting cooking tricks! Check out the Chun Co. Teppanyaki Grill below!